With tens of thousands of students already filling classrooms for the new school year, many Philadelphia families find themselves unable to afford new uniforms and supplies for their children. To help raise funds for those in need, Renaissance Healthcare & Rehabilitation residents have raised almost $4,000 over the past four years through their annual Dance-A-Thon for Families Forward Philadelphia, the city’s largest emergency shelter for homeless families. Renaissance recently presented a check to Families Forward for this year’s donation that was committed to the nonprofit’s Back to School Appeal, which assists children who transfer to new schools throughout the city to have proper uniforms and shoes. Renaissance selects as many as 10 residents each year who become the fundraisers for the Dance-A-Thon event. Weeks before the big party, the designated individuals utilize pledge sheets and raise money from visitors, family members and staff by committing to dancing the entire time of the event. McCracken initially met with residents four years ago and discussed how they could make an impact on several community issues. The residents decided they wanted to make homelessness a top priority and after some research they identified Families Forward Philadelphia as a neighborhood nonprofit they could help the most. 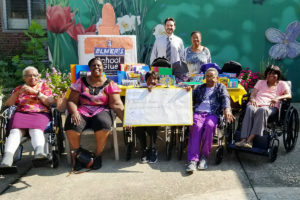 In addition to raising money for school uniforms, Renaissance residents collected school supplies from visitors and staff at the facility and also donated them to Families Forward. This included backpacks, pencils, crayons, notepads and many other necessary items. Every year, the residents create a large donation box to display in the lobby. This year it was a life-size Elmer’s Glue bottle to hold all of the supplies. “The Residents at Renaissance continue to be a beacon of hope and sharing their own strength during times when it’s needed most,” said Miller. West Philly Police Officers Turn Out for Appreciation Breakfast!